Lou's "real job" is a Federal Probation Officer! 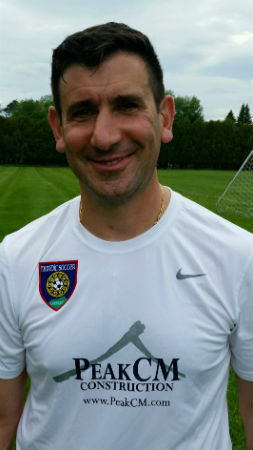 His playing career included playing in Seconda Catagoria in Italy 1993; Won NJ Men's State Cup in 1996; NJ Budweiser Cup 1998; New Jersey Champions League; VASL Champion 2015 & 2016, runner up 2017 and hard to believe, is that Lou is still playing!! Lou's coaching experience - Norfolk Academy (assistant coach) Norfolk, VA. (1989 - 1992); St. Peter's College (Women's assistant coach and goalkeeper coach) Jersey City, NJ (1997 - 1999); Seton Hall University (Women's goalkeeper coach - on coaching staff with former England Capt. Kelly Smith) (2000-2003); Rutgers University Newark (Men's assistant & goalkeeper coach) (2004); Coached for United Soccer Academy, PDA, NJ ODP & Match Fit Academy (1999 - 2003); UVM (Men's Goalkeeper coach 2005 - 2010 - Reached NCAA 2nd round in 2007); St. Michael's (Men's goalkeeper coach 2012). Fun fact about Lou - die hard Romanista, enjoys cycling, has been mistaken for Luis Figo (even in Portugal)....but not on the soccer pitch!!!!! !